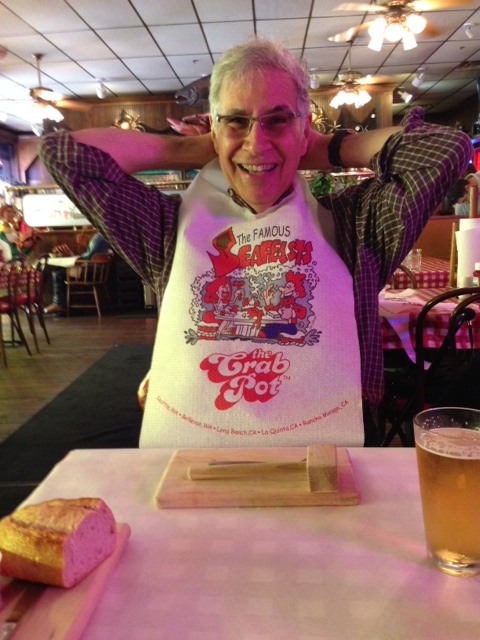 Our trip to Seattle included a stop early on at The Crab Pot in the city’s famed Pike Place Market. Yes, I know, the place is known as a tourist trap and many reviews complain of poor service in the evenings when it’s busy, but we were lured in by the seafeast in which they dump a bucket-load of seafood on your table and you have at it. Me, preparing myself for the Crab Pot seafood feast. 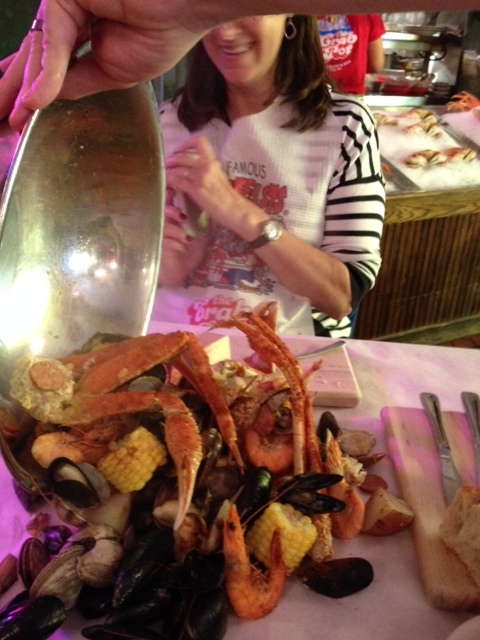 We had better seafood at other Seattle spots, but for sheer fun, the Crab Pot still is worth a visit. WE did go in the late afternoon when it was empty, so service was good for us, being one of the very few tables filled at the time. While the feast is primarily seafood it still put me over my salt daily limit of 1,200 -1,500 mgs, but this was one time I felt I could splurge given the low-fat nature of everything I ate. The feast we bought (there are several choices) included clams, mussels and crab, all of which are high in salt given they’re salt-water creatures. Also included is corn and potatoes. The feast is better viewed than explained, so here’s our photo gallery from the experience, enjoy! 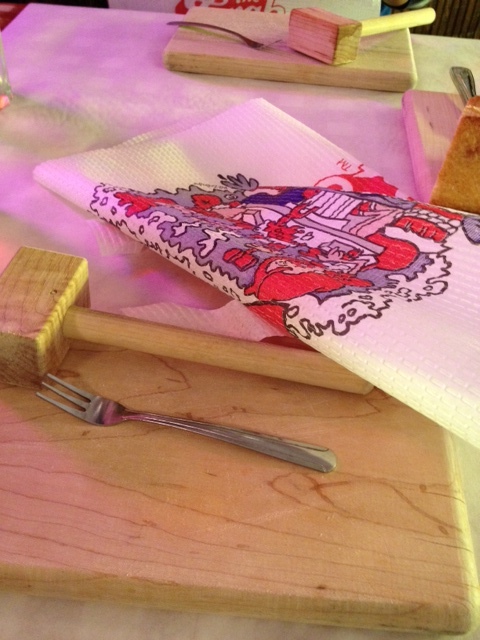 Your tools for the seafeast, a hammer for breaking shells, a small fork and a bib to protect yourself from the spray. The feast gets dumped on your table and you have at it, I loved it. 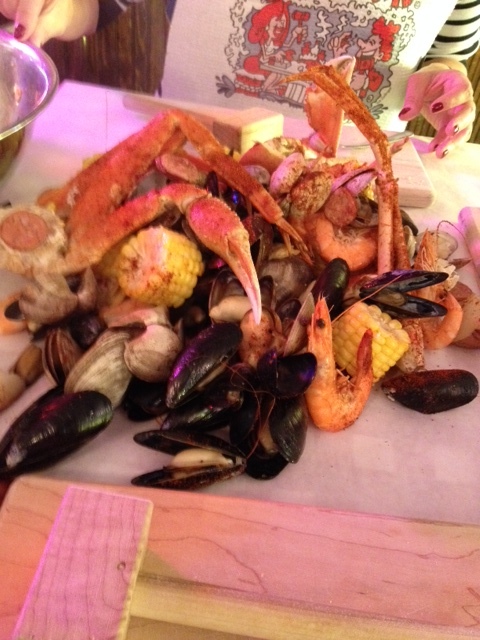 The feast option we bought included two kinds of crab legs, mussels, shrimp, clams, corn and potatoes.